Releasing electroacoustic music in this country has historically, always been a dedicated pursuit. With no national record labels and very few electronic music studios to support this music, the UK has always lagged behind its counterparts in both the United States and throughout east and west Europe. Trevor started releasing his own music in 1973 and continues to do so to this day. Much of this CD was originally privately released in 1979. Whilst other maverick British composers (Nyman, Bryars, Cardew etc.) chose to stay out of the electronic music studio, Wishart and a few others, (starting out in 1961 with the pioneering LP of musique concrète by Desmond Leslie), took the plunge. This CD comprises a complete reissue of the 1979 LP with an additional 4 Menagerie pieces added to the 6 on the original release, plus an improvised solo vocal piece recorded at the old Recommended Records shop in London on 30th March 1991. Beach Singularity was performed on the beaches at Morecambe, Cleveleys, St. Annes, and Southport in the summer of 1977. Trevor Wishart - tapes, miscellaneous vocals. Tracks 1-10: Menagerie: began life in 1974 when Trevor Wishart asked a number of well known British performance artistis to build small assemblages for an exhibition in which each object would be accompanied by appropriate taped sounds. The exhibition, consisting of eleven assemblages, was first prepared for the Birmingham Arts Lab and presented there in January 1975. The accompanying tapes were all made at The University of York Electronic Music Studio by Trevor Wishart. Menagerie and Beach singularity previously released on LP in 1979. This is a quality reissue of two classic works by another electroacoustic maverick. Menagerie comprises 10 tape pieces to accompany found object sculptures commissioned from performance artists, whilst Beach singularity is the remaining document of an environmental work from 1975 performed unannounced on the beaches of British seaside resorts. The tape work that remains takes the twisted reworkings of popular seaside tunes by Wishart's friends and mixes them up with Wishart's own 'Fanfare' (for trumpet and tape) and Winston Churchill's Dunkirk speech and other material. Wishart has catalogued the variety of sounds it is possible to make with the mouth and vocal apparatus. Here he demonstrates them in a ten minute untreated vocal improvisation, Vocalise, (additional material for this reissue), recorded in 1991 in the intimate shop space that was at Recommended Records. Three rather variable pieces for the price of one. Menagerie is about the best for my money, although not exactly a satisfying listen. It was planned as an art gallery installation event, with sound pieces by Leeds-born composer Trevor Wishart to match up with strange assemblage objects by some English artists. Photos of some of these are thoughtfully provided in the booklet. Mick Banks' Still life pitches his precariously balanced teacup on top of a stack of paperbacks about to fall over, against a worrisome soundtrack of a housewife apparently screaming herself to death as she listens to Tony Blackburn over domestic sound effects of boiling kettles. Michael Scott's Musical box is an old broken record played by a phallic carrot to entertain two Barbie dolls; guess what innovation Wishart devised for that canard... that's right, a skipping old broken record! This is probably making 'Menagerie' seem more interesting than it is; a visit to such an installation might have seemed radical in 1974, but now seems merely quaint. The artists need to go back to their Joseph Cornell cribs (they have none of that wounded US surrealist's pathos, humour or invention.) Wishart's tape collage sounds are diverting enough, but don't really stand up by themselves. Beach Singularity we had best draw a veil over - or at least a white canvas tent flap. 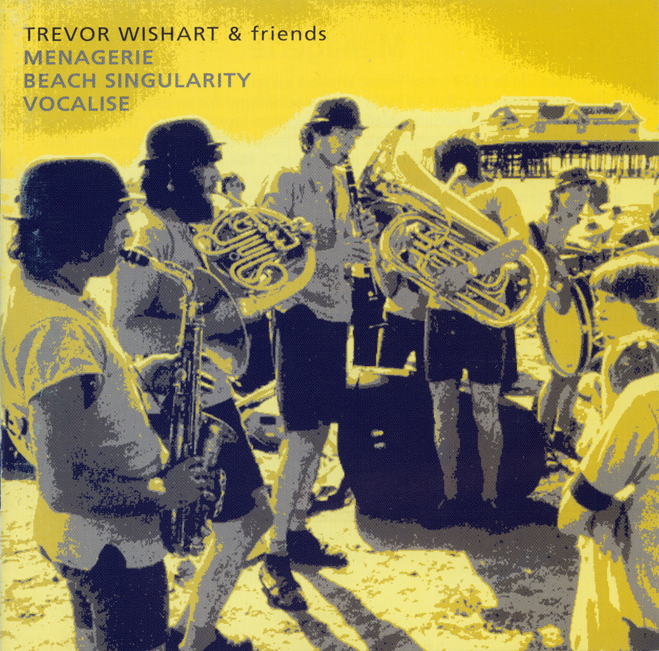 Wishart went down to the seaside to perform on beaches in Lancashire in 1977 along with his Palm Beach Orchestra - a virtual German oompah band (tuba, sax, clarinet, horn) of his friends dressed in funny shorts and little bowler hats. The resulting Ôavant-garde' versions of 'Surfin' USA' and 'A life on the ocean wave', treated with live tape collage mixes, are ghastly; it's a bit of English whimsy trying to say something about English whimsy, and I suspect deeply patronising to its intended audience. Only the dreaded Promenaders come close to this ironic Ôserious-hilarious' pomposity. Vocalise is a Wishart solo having a stab at the Henri Chopin style of making mouth music in an extended vocal improv performance; a left over from Howard and Andrew Jacques' 1991 Recommended Records shop gigs which I don't think made it onto the These CD release. For what it's worth these pieces are rare, originally only available on a 1979 privately pressed LP.